In this post, I have written about seven extremely fearsome and deadly revenge spells for killing enemies. 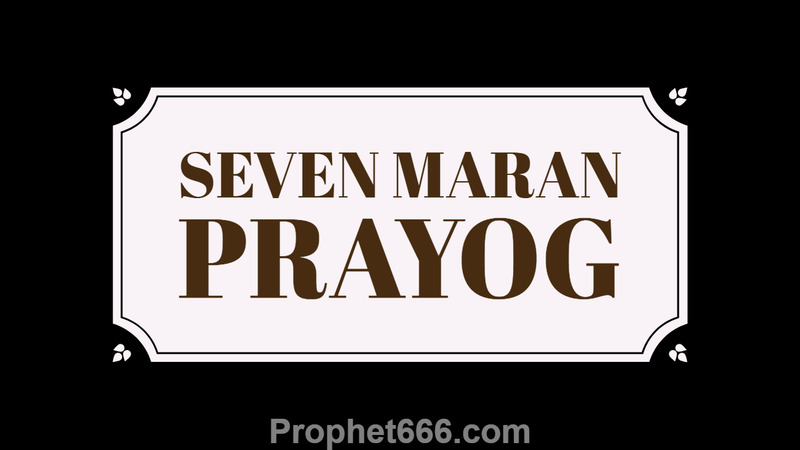 These Maran Prayogas do not need the chanting of any kind of Maran Mantra or the use of a special Yantra for casting these most dangerous spells on an enemy. 1] The feces of the enemy is collected and placed inside a human skull and the name of the enemy is written on the skull and then the skull is buried in a lonely place. As the feces inside the skull starts drying up, the enemy starts falling sick and dies when the feces has completely dried up. 2] If the feces of a donkey is mixed with poison and powdered and secretly thrown on the body of an enemy, the enemy will soon die. 3] If the feces of an owl is mixed with poison and powdered and secretly thrown on the body of the enemy, the enemy will surely meet his end. 4] If a piece of wood taken from a funeral pyre of a dead person is buried near the entrance of the home of an enemy, the enemy will soon die. This Maran Prayog will be successful only if it is practiced during the specific period of a Bharani Nakshatra, which falls on a Tuesday. 5] If a human bone is powdered and a little bit of that powder is mixed in a Paan and given to an enemy to eat, the enemy will soon meet his end. 6] If the flesh of a scorpion and the flesh of an owl are mixed together and powdered and then secretly thrown on the body of the enemy, the enemy will surely meet his end. 7] Bhallataka Oil, Poison of Datura and a tooth of a black colored snake are powdered together. If this powder is thrown on the body of an enemy, the end of that enemy is near. Notes- Even though, this site has published the most unique and rare Mantras, Yantras and Remedies for taking care of enemy related problems, this site has never endorsed using such most destructive and Tamas Guni Tantrik Spells, unless it is a matter of life and death. Maran Experiments should only be practiced to save your life or the lives of your family members and friends. They can also be used as a last resort to destroy an evil person, in order to save the lives of the general public. This site is not in a position to vouch for the success or failure of the Maran Prayogas given in this post because everything depends upon the intensity with which the practitioner practices these spells. Poision means what sir,and how to extract poision of datura.